I'm joining in on Vintage Thingies Thursday over at Coloradolady today. Bring some of your favorite vintage things and join in the fun! 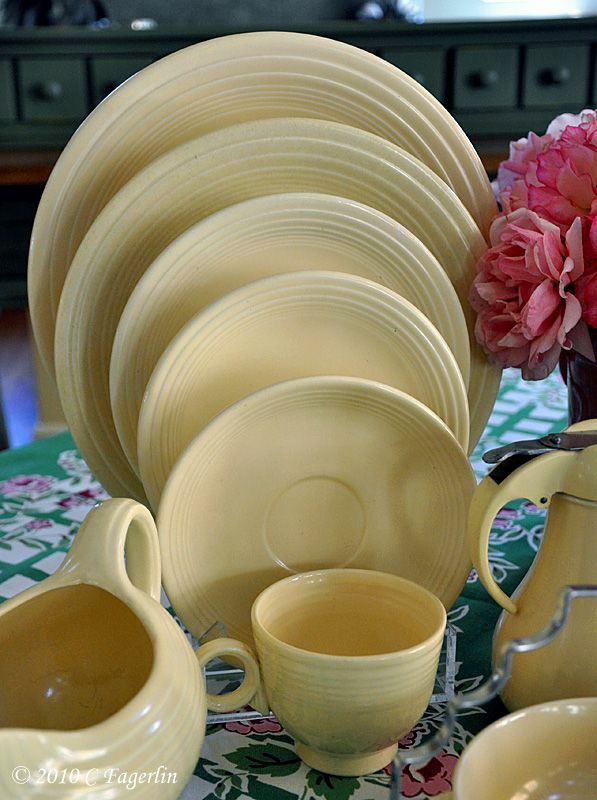 from 1936 is one of the original colors produced in this iconic line of dinnerware. Fiesta is still produced right here in the USA by Homer Laughlin. It stands alone as the finest US china company still producing its wares. 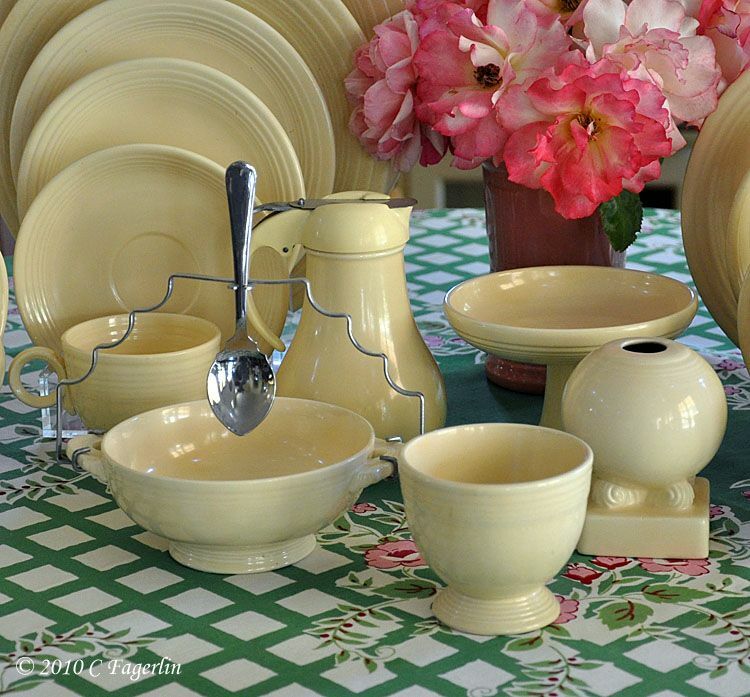 Here are some examples of vintage Fiesta in Ivory from my collection. 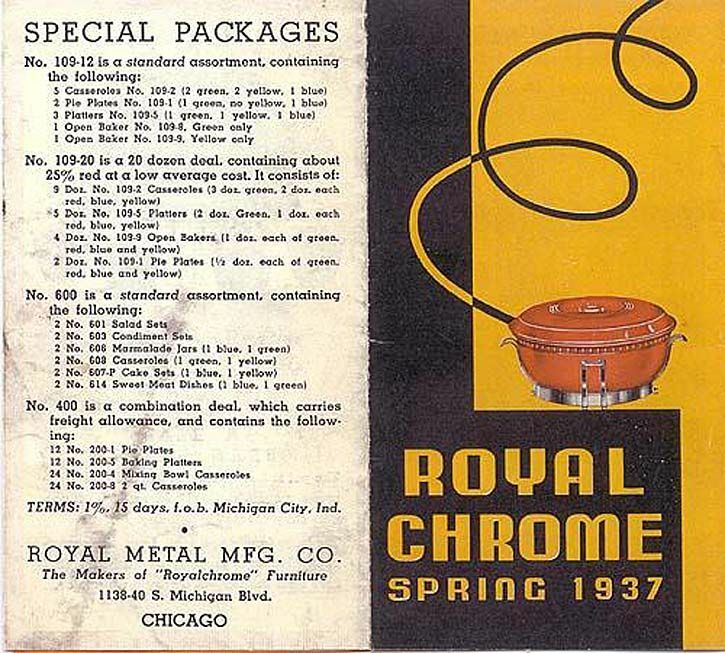 especially for the vintage Fiesta items by Royal Chrome. And here is the first known print example of Fiesta. The image was taken by Margaret Bourke White and was included in an article entitled"
A Bride's First Buffet" and was printed in the 1936 Delineator Magazine. Tune in next week when I'll feature another of the original colors of vintage Fiesta. 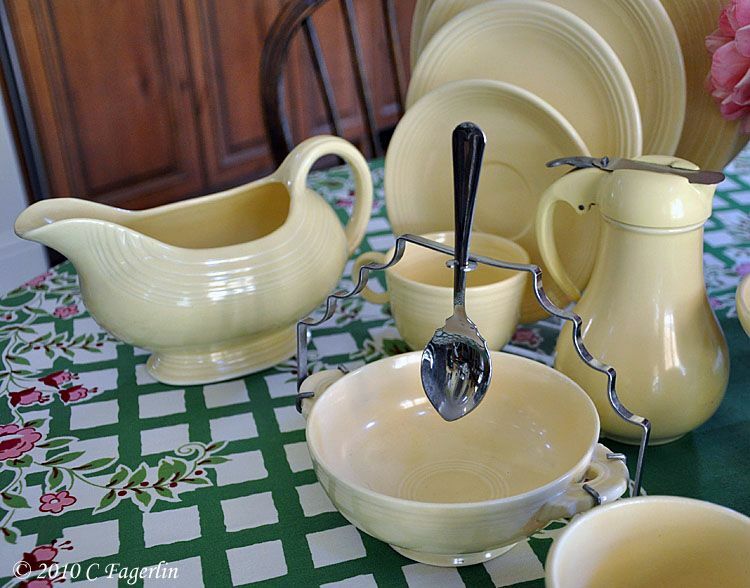 Thanks for stopping by for another Vintage Thingies Thursday here on The Little Round Table! in this week's Tablescape Thursday post. You really have a nice assortment of dishes. Anything you find today with Homer Laughlin's name seems to be in demand. Oh My! I've never seen the ivory. My search is on. And I thought Fiesta was just about color! The ivory is beautiful too. You have a wonderful collection. I never knew about the ivory Fiesta--I thought it all was bright colors. Seeing that brochure was so fun! I love Fiesta but don't own any pieces. Your Ivory collection is to die for! What an amazing color of Fiesta ware....It is beautiful and you have a wonderful collection to say the least!! Have a great VTT! Beautiful and classic collection. I love the history, too. You have an outstanding collection! I didn't know Fiesta Ware came in ivory. Great information. Those chrome pieces are wonderful! What a great collection! 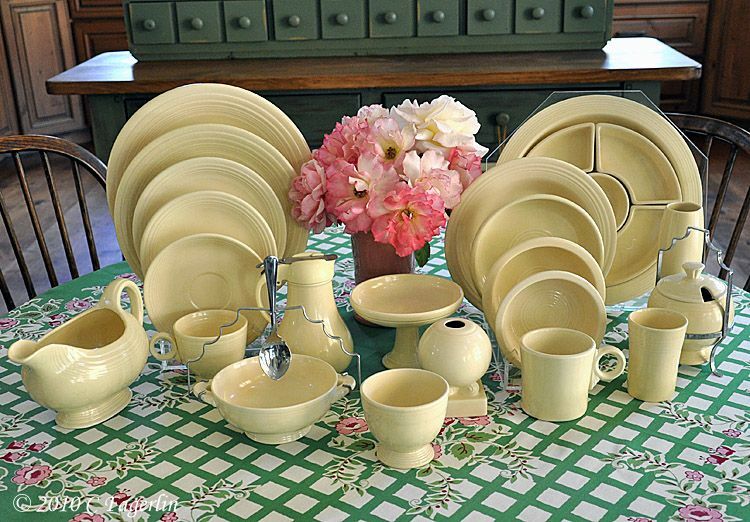 I've never seen the Ivory Fiesta ware. Your pieces are in great shape. There was a time back in the late 80s when I was first starting to collect vintage Fiesta, that I didn't like the Ivory. I passed up many good buys, until finally one day I began to see how to incorporate the Ivory to tone down the "exploded clown" effect that the mixed colors of bright Fiesta can create. Thank you all for coming by to visit on this Vintage Thingies Thursday! you really have a vast collection of fiesta ware and also in many colours! truly beautiful collection! Wonderful! You can really see the beauty of the lines of Fiesta ware when not "distracted" by the beautiful colors! That handle is just gorgeous! 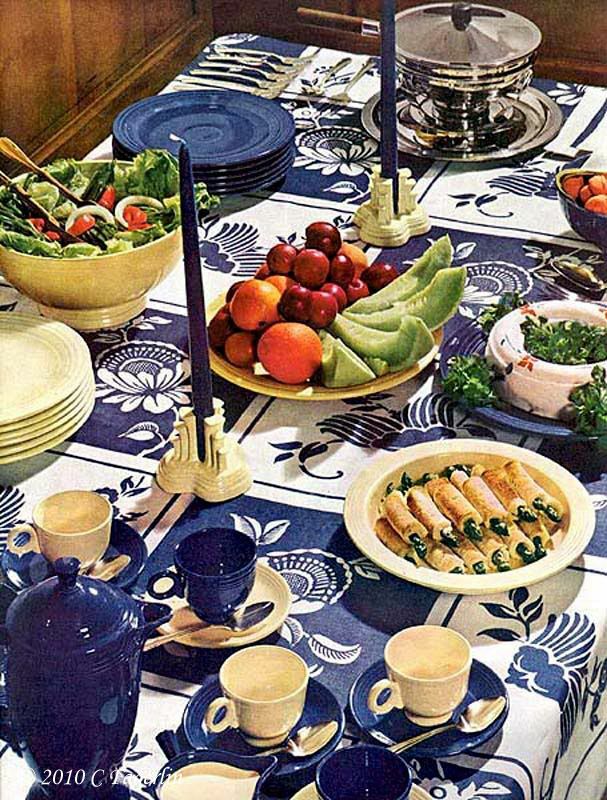 Love the old advertising tablescape...the mixing of the blue and ivory Fiesta is just lovely. Photographed by Margaret Bourke White...they certainly wanted that first look at Fiesta to be perfect! I'm glad you mentioned you started collecting Fiesta in the 80's because I've been wondering how long it's taken you to amass such a fabulous collection!! I've never seen the ivory. I will have to look for it now. Thanks for the great ephemera collection. What a terrific post for VTT!! I did not know that Fiesta had a collection in ivory. It's lovely isn't it? Thanks for such an interesting post today!! Candy, I love learning more about Fiesta! My grandmother had it, but sadly, my mother is the fifth sister of seven, and the older ones got it all! 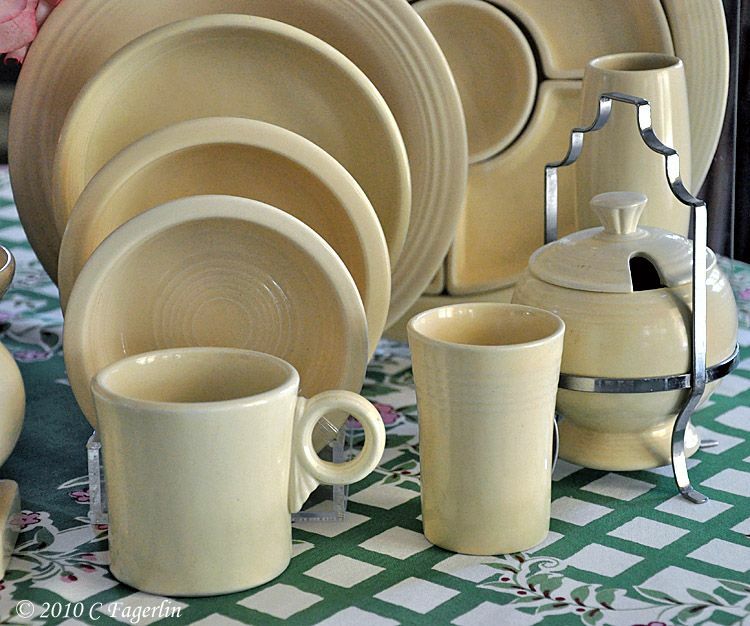 The ivory is lovely, and I especially love the syrup pitcher! I love that creme color. You could use it with any table decorations!!!!! How great. What a wonderful collection you have! I've never seen the ivory before, so lovely and creamy. I adore the syrup pitcher and what is the one with the spoon stand??? Is it a sugar bowl or condiment bowl or??? It's so great! Thank you so much for sharing this with us. 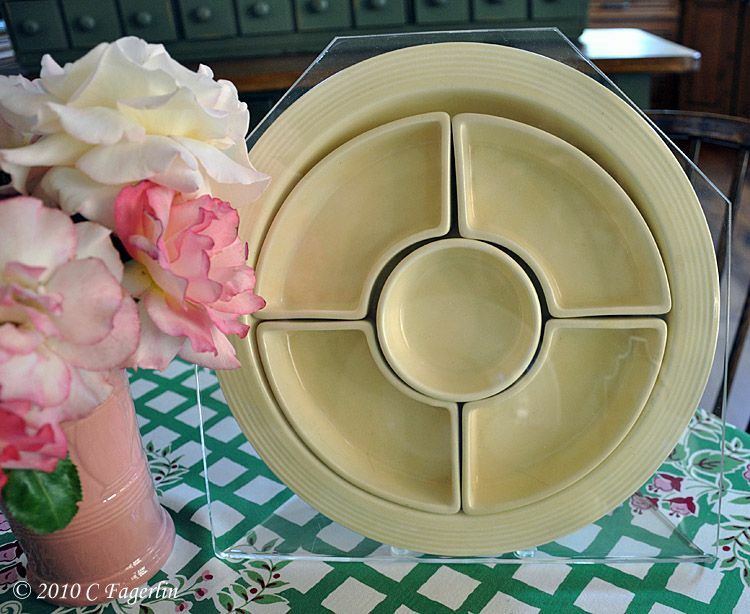 Your ivory Fiesta dishes are lovely. You have done a wonderful job displaying them with the flowers and blue printed tablecloth. What a terrific lesson on Fiesta in Ivory. Thanks for sharing it. Your blog is very pretty. Love your Fiesta ware and you have displayed it perfectly. I remember my grandmother's multi colored Fiesta ware dishes. I thought they were so pretty. Enjoy yours. 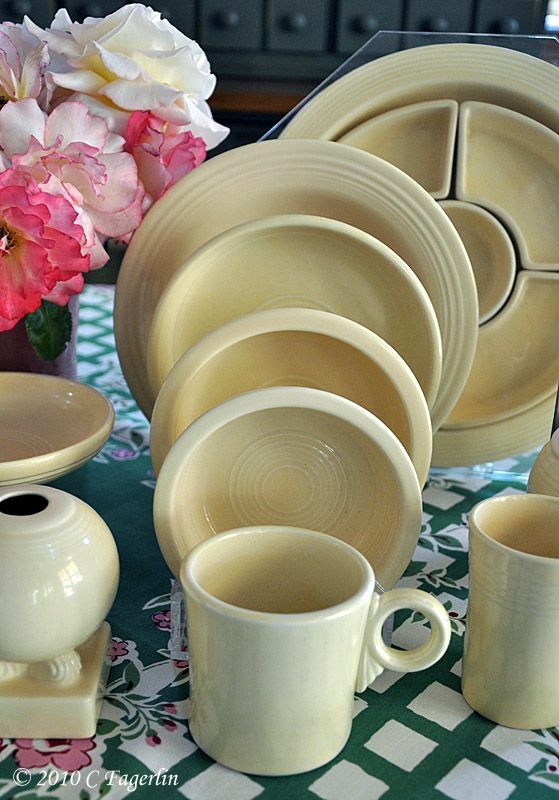 The ivory fiesta ware is my favorite. Your blog is beautiful and very informative. 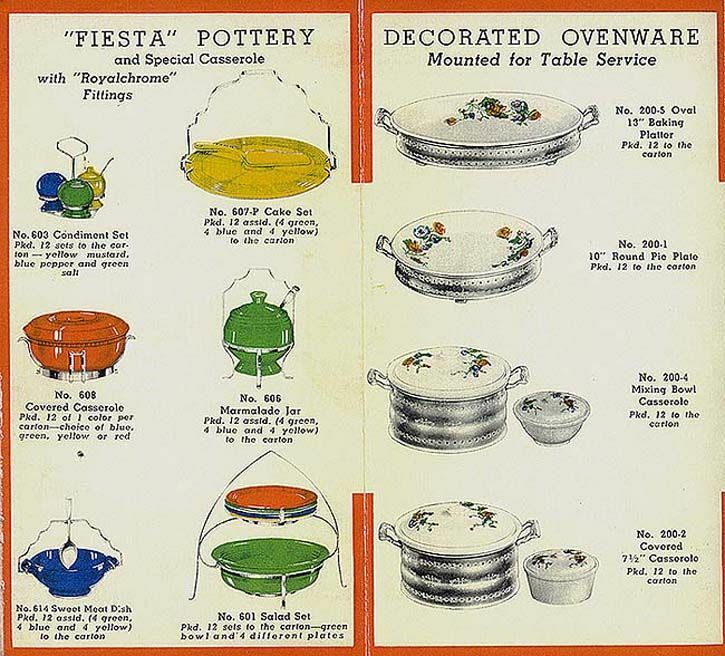 I'm so pleased you are all enjoying seeing some of my vintage Fiesta and learning a little bit more about its history. To answer Sally's question about the bowl with the hanging spoon ..... the bowl us called a cream soup bowl. It's a very lovely shape with its flared handles. In the Royal Chrome brochure the cream soup bowl combined with the chrome holder is called a "Sweet Meat Dish" and is shown with a vintage Cobalt Blue cream soup. "Sweet Meats" = Dessert foods from custards to candied violets were referred to as sweetmeats. Wet varieties were eaten with a spoon and included jellies, creams, floating islands, and preserved fruits in heavy syrups. Dry varieties included nuts, fruit peels, glacéed fruit, sugared comfits and flowers, chocolates and small cakes. I do hope you all can find your way back here for next week's Vintage Thingies, I'll be posting about another vintage Fiesta color. Hi Candy~ ~ ~I love your cream colored Fiesta. When I was a kid and we used it everyday Orange or red i quess they call it, was my favorite color. These days your creams appeal to me so much. The ivory has grown on me over the years and it is very appealing. Thanks for coming by, nice to see you again.